Commonly used in containers and flanges, especially uneven, high-temperature and high-pressure occasions, such as heat exchangers, boilers, pipelines, furnace doors, box covers, etc. 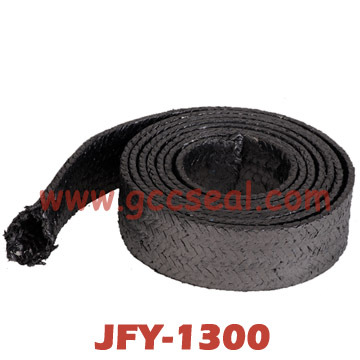 JFY-1300A Graphite braided tape (with sticky layer) - graphite yarn braided tape with self-adhesive sticky layer. Metal wires and metal gauze enhanced graphite woven bands can also be provided. Band-shaped washers are far more convenient to install than traditional cutting washers, and are very flexible in emergency maintenance. Service Range: high-temperature and high-pressure occasions, such as heat exchangers, boilers, pipelines, furnace doors, box covers, etc.